Land Mines - A Love Story is a compelling anti-war film set in Afghanistan, a country that has become synonymous with conflict. It is also a story of romance and a celebration of life, hope and love. CameraWork is the production company of Dennis O'Rourke. After a long illness, Dennis O'Rourke passed away on June 15th, 2013 surrounded by his family and partner. A public memorial was held for Dennis at the Chauvel cinema in Sydney. We produce and distribute films about social issues. From this website you will be able to get detailed information about the films we have made and the films we distribute. There also resources for students, researchers and the media, including reviews and articles, news stories, and photographic images - all of which may be downloaded and used, subject to the copyright and credit provisions. 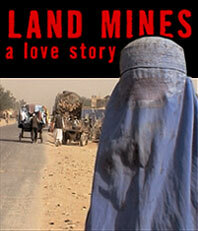 Our latest production Land Mines - A Love Story was shown in competition at the Hot Docs Documentary Film Festival in Toronto this April. In May the film was released in cinemas around Australia, to great critical acclaim (see the 'media' page). The film will have its European Premiere in competition at the Locarno International Film Festival, in August. We are now commencing production of our next feature "I Love a Sunburnt Country". This is a major project, which will look at the poetry and the poetic imagination of 'ordinary' people. Filming will take place all over Australia during the next twelve months. As well as making the feature film, we are helping to produce a sophisticated online / interactive website associated with this project. The expected release date is March 2007. For the very latest developments, please go to news. For any enquiries, please email us.